Slammin 7s is a new game by iSoftBet. This brand new game is quite impressive as it has a unique format and a unique game play. The game has 5 columns with 27 ways to win. This is because across these columns, players will grab a payout when they get matching symbols adjacent on the hexagon format of the game. These matching icons have to be on column 1, column 2 or column 3. The different symbols will give tremendous amounts of payouts. All of these payouts can be viewed at the paytable of the game. Players can open the paytable by clicking on the “I” button under the reels. 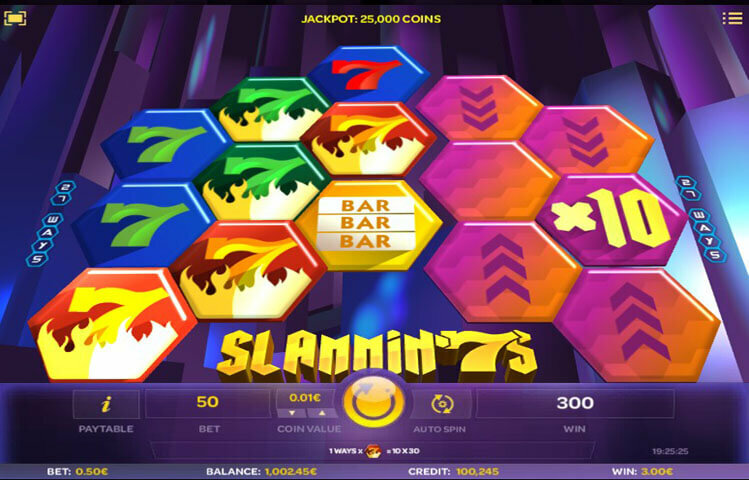 Slammin 7s by iSoftBet is a pretty unique game. This is because of the pretty exquisite format and game play that the slot manages to offer. The game might not look like a slot, but it sure falls under that gaming category. The game has a hexagon shape, as all symbol positions come in the form of hexagons that interlock with each other in order to create the columns and the ways to win of the game. Players will need to get matching icons on the 1st three columns in order to claim a prize. Underneath the columns of the game, players will find the different buttons that they can use to control the game. This includes the spin button, the auto play function, the paytable and the betting option. There is also a cell that shows players the total bet that they have placed as they spin the reels. Slammin 7s has a pretty classic theme. This is why; players will see that the symbols that will be appearing across the reels are inspired by classic machines. These symbols include bar icons, different colored 7s, the re spin icon, 7s on fire, multiplier icons and more. Although the theme of the game is classic, the visuals of the game are futuristic. Even the way each symbol appears is exciting. This is because each hexagon spins in its position to reveal the new symbol. There are three special symbols. The first one is the re spin icon. Whenever this icon is a part of a winning combo, a total of 10 free re spins will be given to the players. During these re spins, all winnings are going to be doubled. Players can claim more re-spins during the re-spins round itself. The second icon is the multiplier icon. There are three of them, x2, x5 and x10. If they are a part of a winning combo, the payout will be multiplied. Lastly, there are instant prize icons that can give players from +25 to +100 coins that will be added to the prize, when landing with any winning combo.